As a small business owner being organized should be at the top of my list of priorities especially when it pertains to having all documents including receipts ready for tax time. But if I am honest, this is one of my biggest areas of struggle as a small business owner. I often found myself scrounging around for my receipts from all the purchases that were made throughout the year. Not only do we need my business to be in order, but we also needed to have our many W-2 forms in an easy to find location. I couldn't just throw them in the junk basket. As you all may remember, we moved around this time last year. Not only did we move, but my husband didn't find stable employment until we had been here for about two months so there were plenty of W-2 forms headed our way at the top of the the new year including several for myself since I worked numerous work-at-home positions for various companies as an employee versus contractor. The new home for all W-2 forms for the upcoming years. Adding the DYMO LabelWriter® 450 Value Pack to my organization arsenal has been a huge help in getting my business finances in order for next year. This handy tool has helped me to get organized while saving me time. 1. Gather your organization arsenal. These are all things that you will need to make your organization attempt is successful. I've learned the hard way that piecemealing isn't the best plan of action when you want to be successful. In my arsenal, you will find a current year planner, a journal/ledger, DYMO LabelWriter® 450, labels (purchase four rolls including LW Appointment Card Labels, LW Shipping Labels, LW File Folder Labels and LW Multi-Purpose Labels and get the DYMO LabelWriter® 450 free in the value pack), file folders, magazine holder, and an accordion file organizer. There's not a need for me to add ink to this list because the DYMO LabelWriter® 450 uses thermal technology removing the need for ink. 2. Use your planner to keep track of all incoming and outgoing money. I use my monthly planner to write down all jewelry sales. Since I have a website, Etsy store, and participate in craft fairs, I find it helpful to have all incoming funds in one place. I also write down all outgoing expenses in my planner. Expenses can easily add up when you're not paying attention. I use plus/minus symbols and write the amount on the day on which the transaction occurred. 3. Schedule a business financial date at the end of the month with your planner and your ledger. I use the last day of the month to transfer all information from my planner to my ledger. For my ledger, I used a journal that I have added tabs to for each month. I appreciate the DYMO LabelWriter® 450 allows me to print using my favorite fonts from my computer, customize the labels from over 60 layouts for my needs, and I can print only what I need without wasting labels. I really believe in being organized in a way that reflects your individual style to ensure success. By having a date with my business finances, I am more likely to remain focused. I am also able to see the areas where the business excelled and the areas where I need to be more diligent. My monthly date helps also helps me to set better, realistic goals for the upcoming month. 4. Use your accordion file! Don't be like me. I did not include nearly $200 in expenses when I filed our taxes because I didn't remember that I made the purchases until after I had submitted our taxes. I did not have the receipts in their home instead I was only reminded when I went into my Etsy store. I felt like I was knocked on the head when I saw all the things I had purchased at the beginning of last year for my business. Use your accordion file to store your receipts properly. I am making sure save a physical copy of all invoices. If your business accepts checks, I would also recommend keeping them in your file too. I tend to deposit checks using my phone which leaves me with the physical check. I used my DYMO LabelWriter® 450 to label a section for checks and receipts ( the font can be as big or as small as I need it). 5. Set up a space where you can store all of your financial records for your business. My work space is not large because we live in an apartment, but that is not an excuse for me not to have a designated area for important business documents. I use a stylish three drawer magazine holder to store my ledger, planner and accordion file organizer. 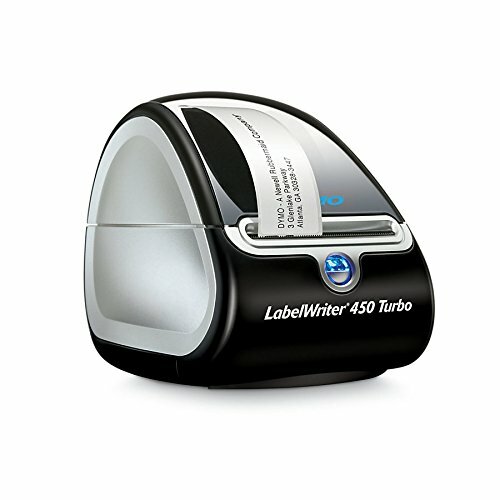 DYMO LabelWriter® 450 has truly made preparing for future tax seasons easier, and has helped me get rid of procrastination fever since every document has a home which is labeled with the exact purpose. DYMO LabelWriter® 450 is also helping with my shipping needs. Gone are the days of trying to put the label sheets in the printer a certain way because I only needed to print one label at a time and wasting money on unused labels. I can now print the exact number ofmailing labels and postage for my packages. This is just another way I will be saving time and money while preparing for next year's tax season. How do you handle your taxes? Are you as organized as you should be with your business finances? What do you have in your planning arsenal? Share some of your tips for preparing for the tax season in the comments.